Product #17666 | SKU IND.SPR.DN | 0.0 (no ratings yet) Thanks for your rating! The Indie-Dolly IND.SPR.DN Singleman Dolly is a portable, spreader-based dolly system that requires only one person to set-up and operate. It supports up to 30 pounds of available camera and tripod, includes interchangeable studio castors and track wheels, and fits into an included soft-sided carry case. The Singleman Dolly is designed to support your tripod and allow it to ride on available tracks. The heart of the system is the spreader unit that folds for transport and features adjustable arms to fit your tripod and available dolly track. It includes a 100mm Hi-Hat that bolts to the spreader and allows you to use an available video head with a 100mm ball or when using the 75mm to 100mm adapter you can also mount a video head with a 75mm ball to the Hi-Hat. Two different sized risers provide a choice in the height of the Hi-Hat on the spreader. The Singleman Dolly includes interchangeable studio castor wheels for repositioning your camera on smooth floors. The interchangeable track wheels are compatible with available IDS dolly track and PVC pipe. Suitable for small productions with limited crew as it requires only one person to set-up and operate. The spreader is adjustable to fit the spread of the dolly track and to match the leg spread of the tripod. 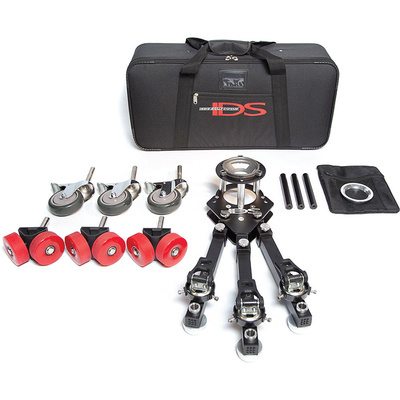 The spreader features bindings that hold the feet of an available tripod secure. Interchangeable castor wheels allow you to roll an attached available tripod around a smooth studio floor to reposition the shot. The castors feature integrated foot locks. The interchangeable track wheels ride on available IDS track or PVC track. The track wheels ride on both straight and curved track. The included Hi-Hat supports 100mm and 75mm ball base fluid heads when using the included adapter.